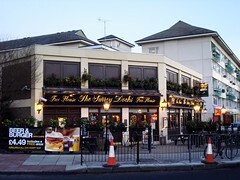 Wetherspoons pub just down the road from Surrey Quays Station. It's a fairly standard Wetherspoons, fairly big inside, cheap beer. There are a couple of sofas near the entrance, standard table/chair seating elsewhere. There's a fair bit of outside seating too. When an RGL posse visited on a Sunday evening in November 2007 as part of the East London Line pub crawl, we had no trouble finding seats. We sat on the sofas near the door and marvelled at the insect documentary being shown on the flat screen near our seats (sound off, subtitles on). It was the last day of the Wetherspoons beer festival, but they still had some left; we drank Mordue Workie Ticket and Holden's Super Nova, both at the festival price of £1.59/pint. Toilets are upstairs; there's a disabled loo on the ground floor though. Last visited by Kake et al., April 2010. Opening hours taken from the Wetherspoons website, January 2017. Last edited 2017-01-22 14:17:38 (version 13; diff). List all versions. Page last edited 2017-01-22 14:17:38 (version 13).